I. walked. the. xtracycle. all. the. way. home. from. school. carrying. the. (2-year-old). with. one. arm. (4-year-old) only fell off the back once. There were tears (mine, theirs). Skinned knees (4-year-old’s). Promises of strawberry ice cream (for me, 4-year-old). Thoughts of some kind of sadistic xtracycle Mama-thon/Iron-woman (mine). I won! I wore my helmet the whole way, optimistic that at some point we would ride, but (the 2-year-old) just wouldn’t. I guess she had a hard day today. What is usually a 10-minute bike ride from the preschool to our house turned into an hour-long walk/carry/push. The 2-year-old — a skilled bike mechanic — normally rides in a kid seat called a WeeRide that mounts over the top tube. So she sits right in front of my wife. The older girl rides on the back of the Xtracycle. The thing about the WeeRide is that it has those foot rests — so the 2-year-old can stand up anytime she is so possessed. It’s like she is one of those Russian horseback trick-riders, who circle the Big Top standing on the back of horse. The straps that are supposed to hold her in place don’t work that well. She can get out them with the ease of Houdini. Maybe we need a better strapping system. But anyone who carts their kids around on bike (or in a car for that matter) surely has faced the occasional tantrum, too. Kid just doesn’t want to ride today and pitches a fit. In a car, though, it’s easier to just strap them in, kicking and screaming, turn up the music really loud and go. That’s not as easy on a bike. One day the younger kid was insistent on riding on the back like her older sister. We ended up giving in on this, but we wanted her to be in front of the older girl, to help keep her from falling off. The most well-behaved of the bunch, I have to say. But we made it home without any injuries. Anyway, after the difficult trip home from school, Sharrow wanted to know if anyone has thoughts or ideas about a better set-up for the younger kid — or whether anyone has other methods to coax a recalcitrant child onto the bike. Y’know, when my youngsters were that age, we would use a double-wide Burley trailer. 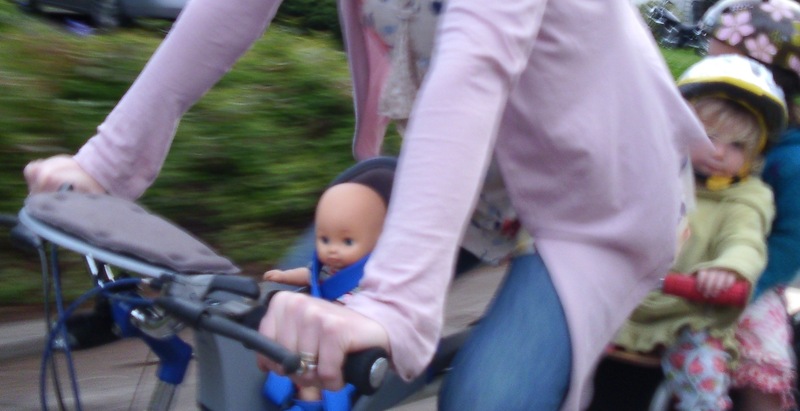 Best of both worlds: bicycling *and* “strap the kicking and screaming tantrum-child” in and go. Still have the trailer, if’n y’all want to borrow it and try. Also am looking to trade it for a light cargo trailer. Gummy bears? When all else fails, I give into the Bad Mama voice in my head and resort to bribery. :) Loved this post. Yep, still going with the double-wide Burley trailer, at ages almost 6 and almost 3. They’re busting out of it, and last week we did have to walk all the way home (big one walking, grumpily, little one riding) after a bout of non-listening by at least one of us (the number depends on which party is doing the telling), but they usually sit and suffer in silence. Beats driving every time. The big one learned to ride a pedal bike with no training wheels last Friday, though, just like that after practicing on his no-pedals bike for months. I see a tagalong seat and an independent rider in my near future. I have an idea – an ipad mounted to each set of handlebars with a full compliment of disney movies on each. Sadly, I think that would probably work. They might have to settle for iPod Touches, though. A couple extra iPads not in the budget. Have to say the supposedly ‘old fashioned’ trailer still has safety, comfort and toys the xtracycle and top tube seat can’t touch. Have to balance parent convenience and trendyness with kid comfort I guess. Some day’s nothing will do. I think you’re right in that the trailer does have some advantages. We used to have one. It is nice not to have to hook it up and take it off all the time — as the place we keep our bikes required that. Good news is there hasn’t been a major tantrum lately. Keeping my fingers crossed.